The United Nations High Commissioner for Refugees (UNHCR) continues the 4th “NAMJAI (Generosity) FOR REFUGEES” fundraising campaign with Saharat “Kong” Sangkapricha to raise funds to support the current global refugee crisis. According to latest UNHCR statistics, one person is newly displaced every two seconds as a result of conflict or persecution around the world. The majority have been driven from their homes by war and conflicts in Syria, Afghanistan and Myanmar. “Kong Saharat & Friends: The Birthday Charity Concert for UNHCR” will be held on Friday 10 May 2019 at Muangthai Rachadalai Theatre with special guests including Burin Boonvisut, Max Jenmana and the famous bands Nuvo, Benja and The Begins Grand. All proceeds will go to UNHCR to support them to deliver basic assistance to refugees around the world. Tickets are available at 800/ 1,000/ 1,500/ 2,000/ 2,500/ 3,000 Baht and can be purchased at any 7-Eleven or on the website www.allticket.com. The upcoming Photo Exhibition by Wannasingh Prasertkul in May 2019. You can also be a part of NAMJAI FOR REFUGEES campaign by making a regular donation via www.unhcr.or.th or calling +66 2206 2144. NAMJAI has no limit to its sharing with those in need. Join the family of UNHCR and help meet the most basic survival needs of millions of refugees. “NAMJAI FOR REFUGEES” won the Asia-Pacific Communications Award 2016 under the category of “Campaign by Non-Profit Organization”. UNHCR aid for Cyclone Idai survivors. 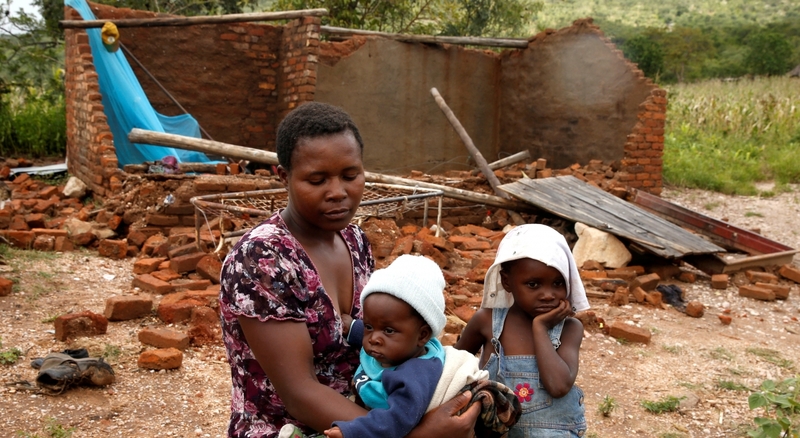 UNHCR and the humanitarian community in southern Africa are deeply saddened by the loss of life and the injuries following the devastating Cyclone Idai that hit Mozambique, Zimbabwe and Malawi between 14 and 16 March 2019. As of 27 March, the cyclone has killed more than 650 people across southern Africa and the number of fatalities continue to rise. Over one million people are estimated to have been affected throughout the three countries, and some 200,000 people to be displaced in the region and in urgent needs of shelter, food, clean water and core relief items. Some 12,000 refugees (3,000 families) out of the 13,000 living in Tongogara refugee camp, south-eastern Zimbabwe, have also been heavily affected. UNHCR and partners are already responding on the ground, relocating affected refugee families to safer shelters and providing life-saving supplies. But more support is urgently needed to reach to all those affected by this disaster, and the Tongogara camp may still be affected by flash floods. We are already mobilizing emergency shelter and core relief items from our global stockpiles to support an initial 30,000 of the most vulnerable people affected by the cyclone in Mozambique, Zimbabwe and Malawi. Eight-year-old Abdulhay has a memory of his father. They are in his yellow taxi, driving through their old neighbourhood in Syria. From the passenger seat, he looks over and smiles at his father. One day her husband slipped out to get food from a nearby community. Along the way, a sniper shot him dead, leaving Rana to raise their five children on her own. They managed to escape to Damascus in 2014. By then, Abdulhay and his siblings were malnourished and had missed months of schooling. But life in the capital, and then in Homs, was a struggle too. After several months they fled to Lebanon, eventually making their way to this informal settlement near Tripoli, in the north of the country. They are one of 28 families, mostly from Homs Governorate, living here in tented shelters – wooden frames with plastic tarps for walls and wood stoves for heat. Today, under blue skies, Abdulhay played football with other children in the dusty compound. But winter here can often be harsh. UNHCR has worked to improve shelter conditions and installed proper latrines to improve sanitation. It also provides winter cash assistance to most of the families here, as well as legal and psychosocial support. Wafaa noted that her daughter and sister recently went back to Talbiseh, the town in Homs Governorate which the family fled in 2014. She calls them often, but the connection is weak. Wafaa’s husband vanished on his way to Lebanon in 2013, where he had hoped to rejoin two of their sons. He and the other people in the car were never heard from again. Wafaa was then displaced inside Syria for 18 months before fleeing to Lebanon with the rest of their children. “When I came here I achieved what I wanted in terms of bringing all of my children together,” she said. She hopes that going back would not jeopardize the family’s safety or unity. Whether, and when, to return is a question facing millions of Syrian refugees in the region. Safety and security is a crucial factor, but not the only one. For many people, the answer also hinges on concerns about housing; legal issues, such as missing documents and property deeds; availability of livelihoods; and access to health care and schools. Meanwhile, young Abdulhay has something else on his mind. He sees other children with their fathers and misses his own, a man he barely remembers. News comment: UNHCR’s Grandi expresses shock following massacre of innocent worshipers in New Zealand. “It is with great sadness that I have heard the news of the horrific attacks against two mosques which took place today in Christchurch, New Zealand, in which 49 people are believed to have been killed. I offer my sincerest condolences to the families and friends of the victims and to the people of New Zealand. I share my solidarity with them in their grief and sorrow. Nearly four years of war have left 24.1 million children, women and men in urgent need of food, shelter, medical care and schooling. When she wakes up in her family’s fragile shack each morning, Hamamah faces the bitter reality of war in Yemen. “Every day is a fight for survival. We do not know how or if we will eat,” says the gaunt 16-year-old. Since heavy fighting drove her from her home in Taiz, a city in south-western Yemen, two years ago, the teenager has known nothing but bitter hardship. With few options, Hamamah got married to ease the burden on her parents, already struggling to feed and provide for her siblings displaced by war. A few months ago, she gave birth to a stillborn girl. Her baby died because, Hamamah believes, she did not have enough to eat and could not pay for medical care. It is difficult to call Hamamah’s residence a house. The structure which shelters her and her husband, Mohamed, looks more like a decaying garden shed. With no reliable paid work, Mohamed struggles to find the US$30 in rent that they have to pay each month. As the war approaches a fourth anniversary in March, the family’s struggle grows more dire by the day. Each morning, Mohamed scrambles to find paid work, which makes the difference between the family eating or going hungry. “Without work you are completely dependent on others… you are at people’s mercy. If I manage to get daily work, I can make three or four dollars a day; so we manage to buy some food…if not…” he trails off. Hamamah and Mohamed are not alone in their suffering. Their desperate battle for survival is shared by most in Yemen, where 24.1 million people – more than three-quarters of the population – are in dire need of life-saving assistance. Today, the United Nations and its humanitarian partners launched an appeal which seeks US$4.2 billion to provide vital aid to Yemenis in desperate need this year, including more than 3.3 million who, like Hamamah and Mohamed, have been uprooted by the war. UNHCR, the UN Refugee Agency, is leading the interagency protection response in Yemen. UNHCR and its partners are providing legal assistance to the most vulnerable – with an emphasis on issuing civil documents that are often lost when fleeing danger. UNHCR also provides counselling to address the mounting psychological impact as a result of the prolonged conflict. Additionally, together with UN and NGO partners, UNHCR is working to improve living conditions on hosting sites for children, women and men uprooted by fighting across Yemen, by constructing transitional shelters, installing water and sanitation facilities and communal kitchens. Where appropriate, UNHCR and its partners are also providing rental subsidies and cash grants to rehabilitate damaged houses. It aims to provide essential household items to displaced and highly vulnerable families across the country. Without continued funding, humanitarian agencies will be forced to discontinue life-saving protection assistance and services to vulnerable people including women, children, the elderly, people with disabilities and survivors of gender-based violence, leading to further impoverishment and heightened vulnerability.